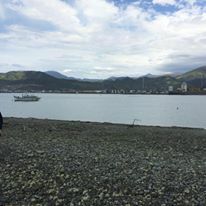 For one week this November from the 6th to the 13th, a group of seven people including both Miyazu citizens and city hall employees visited Miyazu’s sister city, Nelson (New Zealand). In accordance with it being the 40th anniversary of the signing of the Miyazu-Nelson Sister City Agreement, a resigning of the agreement among other ceremonies was held and the visit served as a valuable opportunity to reconfirm the significance of the friendship and bond that the two cities share. We left Japan for New Zealand from KIX Airport on the evening of November 6th. We first arrived in Auckland Airport from which we took a bus to Rotorua. The flight from kIX Airport to Auckland Airport was approximately 10 hours. After arriving in Rotorua, we were guided through a miraculous limestone cave where we got to see glow worms. 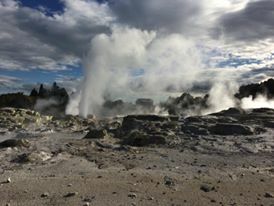 We also visited a giant geyser and got to experience and get used to the New Zealand climate and cuisine. While riding on the bus from Auckland to Rotorua, all that could be seen was pastures and beautiful green vast landscape. The color of the pastures and landscape was so vivid and brilliant that it was very impressing. We also got to have some New Zealand beefsteak and try the local beer and wine which was all delicious. After spending a few days in Rotorua, we left on the morning of the 9th and headed to Nelson via Wellington. We arrived a little after noon and a welcome party holding a welcome sign written in beautiful calligraphy lettering was waiting at the airport to greet us. Everyone who came to meet us at the airport was so warm and friendly and kind. After being treated to a delicious lunch, we were shown Nelson’s famous Boulder Bank (A land form similar to Amanohashidate in Miyazu but with no pine trees and covered in rocks. It is also 13 kilometers long; about 4 times the size of Amanohashidate). Both the Boulder Bank and the ocean surrounding it was very beautiful and calming. The area had a lot of palm trees and seemed tropical. 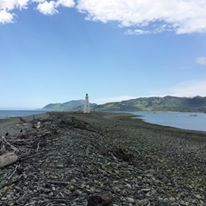 There was a lighthouse on the Boulder Bank that we were going to climb if it wasn’t for the rain. In the evening, a movie night was held by the Japanese Association in Nelson featuring the Japanese film “Maiko is a lady”. 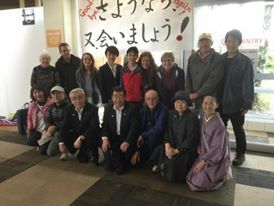 Before the movie started, there was time to chat and mingle with the Japanese residents of Nelson as well as the Mayors of Nelson and the Tazman Area and the Japanese Ambassador who were all in attendance. The Japanese Ambassador also read an English greeting welcoming the visiting party from Miyazu before the movie started. It was a very nice relaxing time. The next day, the group spent the majority of the day sightseeing visiting Miyazu Garden, (We found and took photos in front of the tree that NZ Association President, Mr. Adachi planted with the former mayor of Miyazu and the memorial plaque), the Nelson Cathedral, the winery, and enjoyed a pottery experience at a nearby village. 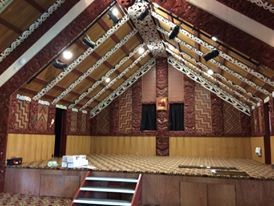 In the evening, an official dinner with the Mayor Reese of Nelson City was held. The resigning of the Sister City Agreement was done on the morning of the 11th. Both Mayor Reese of Nelson and Deputy Mayor Ueda of Miyazu resigned the agreement and the two cities reconfirmed their friendship and bond to one another. It was a very significant event for the two cities. The founder of the Sister City Association also attended the event and the members including the Deputy Mayor were very honored to get to meet such an important person who had contributed so much to the friendship between the two cities. After shopping in the afternoon, we were invited to an evening farewell party at Carl’s house. Carl is the conductor who organized and executed the performances in Kyoto, Osaka, and Miyazu earlier this year. Everyone enjoyed chatting and drinking being reunited with members of the chorus group who visited Miyazu earlier this year and had a very nice time. Even in only a few short days, and despite the language and cultural barriers, everyone was able to become close and enjoy each other’s company and newfound friendship. The members of the chorus group who attended the farewell party sang several songs for us including “furusato” beautifully. Those who had heard the concerts they gave while visiting Miyazu and Kyoto, felt nostalgic and were happy to be able to hear their beautiful singing again. The next morning before leaving, we were invited to have tea and cookies at the former Sister City Association Chairman, Mary’s house. Afterwards we were taken to the airport and received a warm farewell from the citizens of Nelson who had taken care of us while we were there. We are so grateful to so many people who helped arrange our visit including Lyndal who is Chairman of teh Sister City Association and planned our stay, found us hotels, and showed us all around Nelson during our stay; Mary and her husband, Akiko, Carl, and many others who accompanied us on our sightseeing and welcomed us so to their city so warmly. We are very grateful for their kindness and thoughtfulness. We left Nelson on the afternoon of the 12th and traveled to Wellington. Due to the bad weather (rain) and a flight delay, we had to change our original sightseeing plans. We visited Zealandia Sanctuary which tells the history of the native animals of New Zealand, and the Te Papa Museum with many displays of Maori architecture and culture. 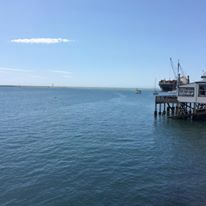 We also watched a video explaining how films such as “The Hobbit” and “The Lord of the Rings” were created and rode a cable car to a look-out point where we could overlook the city. It was raining when we rode the cable car to the look-out point so the entire town was covered in a misty fog. We began our journey back to Miyazu on the morning of the 13th and finally arrived back in Miyazu at around 10 pm the same day (Japan time). We had many memorable experiences and were able to interact with a new culture and the people of our sister city and feel connected to them even though there is a ten hour distance between us by plane. We had a very special experience with many new cultural discoveries. Since Japan is not my native country, this trip was a very good chance for me to travel to another English speaking country besides the US for the first time and compare the culture with my own. 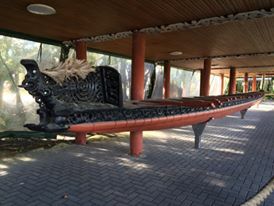 For me, one of the most interesting things about New Zealand was how much the native Maori culture is valued and is treated with respect as the native culture of the land. I was surprised that the Maori language was one of the national languages along with English and sign language. In the United States, we value freedom and equality and strive to achieve it but in reality we still have a very big problem with racism that we have yet to overcome. There were also native people inhabiting the American continent before the European settlers came over who had a very similar belief/value system to the Maori people which was also similar to the Japanese Shinto religion and animism outlook on life. However, in the competition for land, these native peoples were driven from the land and the majority of them died either from disease or in battle. There are very few pure Native Americans left in the United States and large parts of the culture and language of these native tribes has been lost. According to the explanation I heard from the JTB agent, New Zealand has a similar history of driving the native tribes off their land and also has only a small population of pure-blood Maori people. 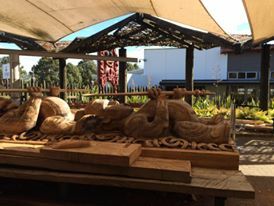 However, they now acknowledge this historical mistake and work to preserve the Maori culture and share it with the world as an important part of New Zealand culture. I thought this was very honorable. The JTB agent also discussed that because New Zealand has a very low crime rate and little racial discrimination it is a popular country for study abroad. One other interesting thing was that all of the restaurants closed very early especially in the more rural town that we visited. We discovered this when we went to eat dinner one night and had a very difficult time finding a restaurant that was still opened. 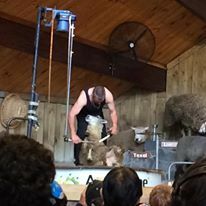 The next day when we asked the JTB agent about this he explained that the people of New Zealand in general tend to value their private life above their work and so they will close their businesses around 5 or 6 pm so that they can spend the evenings with their families. He said that this was quite typical. Some Japanese people may be surprised by this and think that the restaurant owners are lazy or unmotivated but I thought that it sounded like a good way to live a fulfilled life in a non-monetary sense. 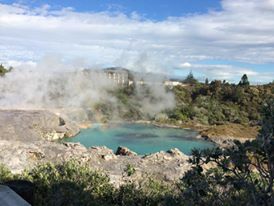 Lastly, out of all the places that we had a chance to visit the place the was most memorable for me was the limestone cave and glow worms in Rotorua. It was so exciting to be in a cave and the glow worms on the ceiling of the cave looked just like a starry night sky. It was so breathtakingly gorgeous and an amazing experience. For six days from June 4th to June 9th Miyazu hosted a group of three chaperones and seven high school students from its sister city, Delray Beach. During their stay, the visitors participated in several activities such as attending a Japanese school, visiting local sightseeing spots, and meeting with the mayor of Miyazu. The seven high school students each stayed with a host family while the chaperones stayed in inns and hotels in the Amanohashidate area. In between their arrival on June 4 and their departure on the 9th, the group experienced the beauty of Miyazu by participating in several activities designed to convey the historical value and appeal of the city. The students attended Miyazu Senior High School and by doing so were able to get a taste of what daily life is like for a Japanese high school student as well as learn about the Japanese education system. Not only did the students learn about Japanese school life but they also presented to the Japanese students about their own town and school culture. This was a good opportunity for the students to learn about eachother and cultural differences. The students also visited the Marine High School located in the Kunda area of Miyazu. The chaperones also attended this visit. A meeting with the mayor was also held. During this meeting, he students were able to ask many questions about the cultural significance and meaning of the different areas they had been shown by their host families as well as ask and learn about Miyazu history and culture. I was very happy to be able to attend this meeting and serve as an interpreter between the mayor and the high school students. Cultural experiences were also planned and executed by the Delray Beach Friendship Association.Cultural experiences included a visit to Kanabiki Waterfall, Japanese Aizome, and Tamgoyaki making in which students were shown how to make tamagoyaki and also got to taste it. 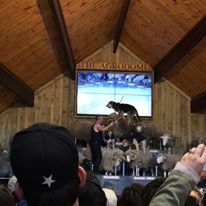 The students were able to experience Japanese representative culture as well as the unique culture of Miyazu. The students especially seemed to like Kanabiki Waterfall which is also popular among the foreign residents of Miyazu. The students played in the water and took many selfies as well as a group shot at the end before leaving. The most impressionable and impactful experience out of the ones I attended for me was the farewell party held the day before the group’s departure. The farewell party was attended by the high school students, their host families, the members of the Delray Beach Friendship Association, and several city employees and was held at a fancy grand hotel in the Amanohashidate area. Even though, the time the students were only in Miyazu for a total of six days and the time they spent together was very short, they enjoyed chatting and taking photos together and were very reluctant to leave at the end of the party. They had a hard time saying goodbye to each other. The thing that most impressed me personally was the students’ individual speeches before the closing of the event. The Japanese students and American students were asked to give short individual speeches about their experiences over the past six days. The American students were asked to give speeches in Japanese and the Japanese students in English. The American students had their speeches translated and were prepared but the Japanese students mostly spoke all in Japanese so while I had to Interpret at least a part of everyone’s speech translating the Japanese students’ speeches was my main job. Everyone was in tears when they read their speeches. They talked about how important the relationships and connections they had made with everyone there were to them and how they would never forget their experiences they had here. They also talked very passionately about wanting to utilize their experiences in the future and not wanting their experience to go to waste. 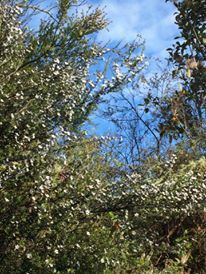 I was impressed that the students were able to share and experience so many things and make such deep connections with those around them in such a short period of time. I was also impressed that the high school students were able to not only realize the importance of their connections with the people around them and how precious they were but also were be able to be grateful and express their feelings of thanks in words despite only being 15 or 16 years old. I deeply felt that it was very significant that the students came to Miyazu and had this experience at an age where they were still young enough to be impacted and implement the experience into their future plans and goals but mature enough to grasp and understand the meaning and significance of their experience. After listening to the students’ emotional teary speeches, I felt certain that even if they don’t choose a career having to do with international exchange that they will make use of their experience either personally or in a different career.I was deeply moved and realized that this was what cultural exchange and raising globally aware adults is all about. I was so grateful and happy to have been able to attend and be a part of this event that inspired not only me but everyone in attendance.